Emory senior Caiwei Huang and alumnus Zihao Zhang are among 129 students from across the globe awarded Schwarzman Scholarships for graduate study next year in China. They are Emory's first Schwarzman Scholars. Students interested in learning more about the Schwarzman Scholars Program and other prestigious awards should contact Megan Friddle in the National Scholarships and Fellowships Program. Emory senior Caiwei Huang and alumnus Zihao Zhang have won the 2017 Schwarzman Scholarships for graduate study next year at Tsinghua University in China. 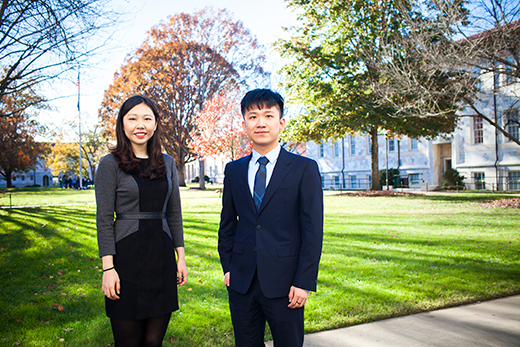 Huang, an Emory Scholar expected to earn her dual bachelor’s and master’s degrees in political science in 2017, and Zhang, who graduated with highest honors in 2016 with a bachelor of business administration and bachelor of arts in mathematics and economics, are Emory’s first Schwarzman Scholars. They are among 129 students from across the globe who will earn master’s degrees from one of China’s leading universities, in a program designed to bridge the academic and professional worlds to educate students about leadership and China’s expanding global role. Huang and Zhang both excelled at Emory and will bring important university connections — including the Carter Center, faculty with interest in East Asia and student groups focusing on the region — to their new community, says Joanne Brzinski, senior associate dean for undergraduate education. “Both have contributed to a better understanding of China in their activities at Emory, and reflect the innovative and engaged international students attending Emory,” Brzinski says. Each scholar will earn a master’s degree in global affairs, with a focus in one of three disciplines: economics and business, international studies and public policy. Classes are taught in English. Huang is a native of Henan Province in Central China, though she and her mother left the country for Singapore when Huang was 8 years old. She transferred to Emory in fall 2014, having completed her freshman year at Nanyang Technological University in Singapore, and immediately began working on Chinese-English translations and other events in the China Program at the Carter Center. She credits Thomas Remington, the Goodrich C. White Professor of Political Science, with sparking an interest in local government policy in China. Her work as Remington’s research assistant has evolved into a joint project showing the research value of Chinese work reports and her emerging interest in energy policy and its impact on the environment. She attended the United Nations climate change conference in Paris as an official observer last year and also worked as an intern with the Carnegie-Tsinghua Center for Global Policy in Beijing. Huang plans to use the Schwarzman to potentially launch into a doctoral program or may work within China, on the domestic policy issues, especially environment and energy policy, that she has studied. “One very important part of my study is improving communication between Chinese and American students, and now I will work on that understanding with Chinese and American leaders," she says. Zhang, who is also from China, was selected for Emory's 100 Senior Honorary in 2016. He has already begun working as an actuarial analyst at Willis Towers Watson in Atlanta. His work focuses on helping mid-size and large companies design ways to control health care costs, but Zhang plans to further study economics and business at Tsinghua University in a bid to help smaller Chinese firms — like his parents’ company in Anhui province in Eastern China that connects steel factories with raw materials — navigate the slowing economy there. His tenure at Emory will help with preparations. While on campus, he founded and served as editor-in-chief for the bilingual Sino-Emory Newsletter, Emory’s only monthly bilingual newspaper. Zhang also launched a collaboration with the Carter Center to publish the U.S.-China Relationship Report in English and Mandarin and, as head of the Emory Media Council, spearheaded an effort with the Rose Manuscript, Archives and Rare Book Library to archive campus publications. He served as co-president of the Goizueta Actuarial Science Association and vice president of Omicron Delta Kappa while starting his own investment firm, Z Capital Management.